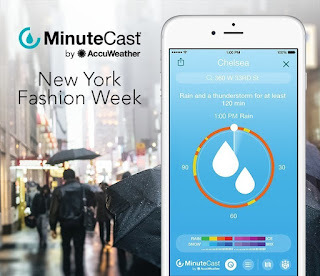 AccuWeather MinuteCast Keeps Fashion-Forward Crowd One Step Ahead of Rain during New York Fashion Week -- AccuWeather's unique hyper local, minute-by-minute forecast will help keep attendees dry and stylish through possible thunderstorms. With a strong chance for opening-day humidity and thunderstorms – and the possibility of localized flooding – dampening New York City's Mercedes-Benz Fashion Week, AccuWeather, the global leader in weather information and digital media, offers the perfect complement to any chic dry-clean-only ensemble with its proprietary minute-by-minute precipitation forecast, available on award-winning AccuWeather apps and AccuWeather.com, and free to all users. Fashion enthusiasts can check their AccuWeather MinuteCast® to ensure they look their best as they travel from runway to runway, with up-to-the-minute precipitation forecasts for the exact street address of each venue. The week-long event is likely to commence with showers and "a thunderstorm or two with the best chance for downpours during the afternoon and evening hours," according to AccuWeather senior meteorologist, Paul Walker. "Some of the rain may be heavy and lead to localized flooding, especially in low-lying areas and areas with poor drainage," Walker added. Although skies are forecast to clear in New York City on Friday, there is a chance for another thunderstorm on Sunday and more rain into next week, making umbrellas and AccuWeather MinuteCast two essential accessories for attendees. 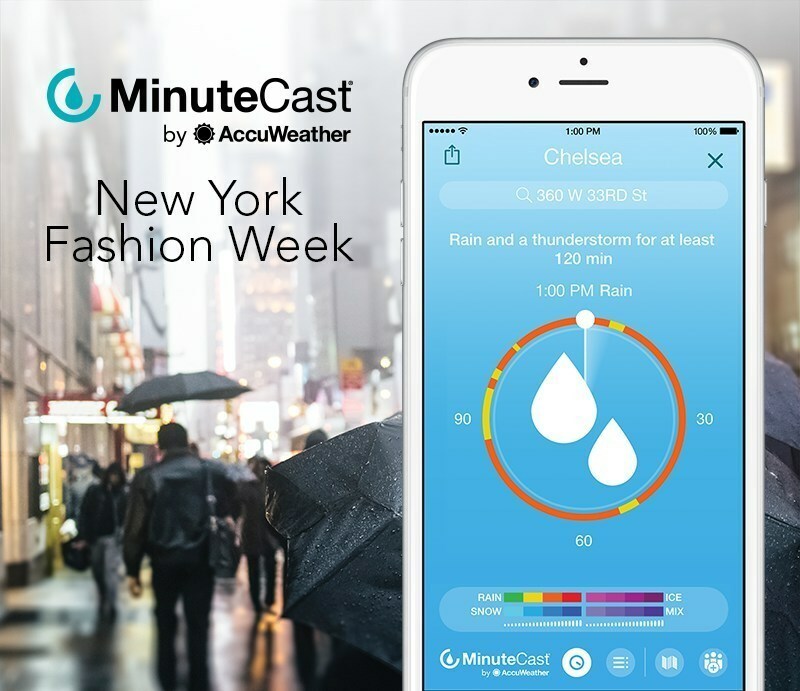 "With the potential for rain during Fashion Week, the free AccuWeather app featuring MinuteCast keeps attendees informed and aware of when precipitation is going to begin and end for the next two hours, with a personalized forecast that provides weather updates at the exact GPS location or address of each event," said Steven Smith, President of Digital Media. "AccuWeather MinuteCast is another example where meteorology and technology meet lifestyle – a must-have for important events and every day to help your life." The AccuWeather MinuteCast Storm Squad will be on-site at various locations during New York Fashion Week with umbrellas to educate fashion-forward crowds about AccuWeather MinuteCast and help to ensure attendees do not get caught in inclement weather while traveling from Skylight at Moynihan Station to Skylight Clarkson Square. The AccuWeather app with MinuteCast is free and available across all AccuWeather digital platforms. Consumers can visit www.accuweather.com for more information or to download the app. Every day over 1.5 billion people worldwide rely on AccuWeather to help them plan their lives, protect their businesses, and get more from their day. AccuWeather provides hourly and Minute by Minute™ forecasts with Superior Accuracy™ with customized content and engaging video presentations available on smart phones, tablets, free wired and mobile Internet sites via AccuWeather.com, connected TVs, and Internet appliances, as well as via radio, television, newspapers and the new AccuWeather Network cable channel. Established in 1962 by Founder, President, and Chairman Dr. Joel N. Myers – a Fellow of the American Meteorological Society who was recognized as one of the top entrepreneurs in American history by Entrepreneur Magazine's Encyclopedia of Entrepreneurs – AccuWeather also delivers a wide range of highly-customized enterprise solutions to media, business, government, and institutions, as well as news, weather content, and video for more than 180,000 third-party websites. AccuWeather's CEO, Barry Lee Myers, is an award winning leader in global weather information issues and one of the world's most recognized advocates for cooperative relationships between government weather agencies and the weather industry. He is a leader in the digital weather information space. 0 comments on "AccuWeather MinuteCast at New York Fashion Week"